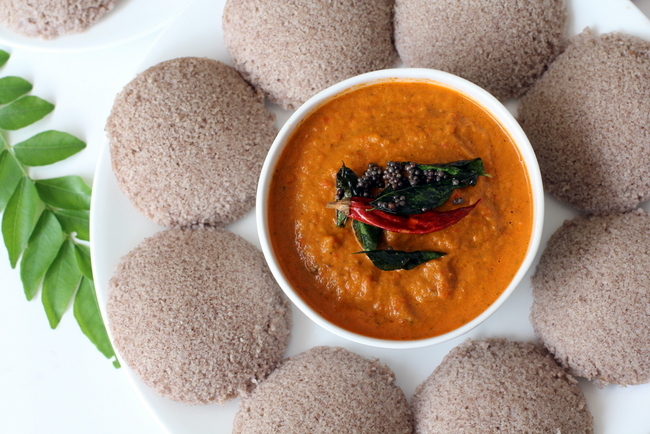 Last week, I prepared Ragi Idli for our morning breakfast and served it with Tomato Pachadi. I cannot emphasis enough the nutritional value of Ragi and it makes sense to include this humble grain (finger millet) in our daily diet. There are many Indian recipes using ragi flour include Ragi dosa, Ragi Malt, Ragi Roti and Ragi Mudde to name a few. In rural India, this poor man’s grain is extensively cultivated and consumed by the rural folks because of its nutritional value (high protein with low glycemic index) and affordability. Soak urad dal for about 2 to 3 hrs. Soak the idli rava in water separately for an hour before mixing with urad dal batter. After 2 hours drain the water from the urad dal and grind to a smooth paste adding 3/4 cup of water. Squeeze out the water from the cream of rice and add to the ground urad dal batter. Add the ragi flour and mix. Mix well till well combined. After 10 hours you will find that the mixture will be double the original volume. After fermentation, add salt and pinch of soda bi carbonate and mix well. The batter is now ready to make idlis. Serve with sambar or chutney of your choice. 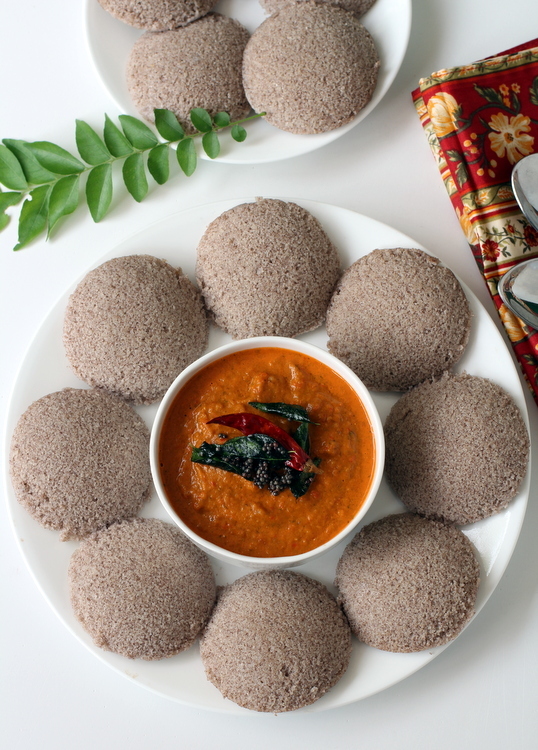 Similar to Rava Idli, you can add tempering to the ragi idli batter. Heat 2 tsps oil, add 1/2 tsp mustard seeds and allow to splutter. Add a tsp of urad dal, a tsp of chana dal and allow the dal to turn red. Add a tsp of grated ginger,2 chopped green chilies and few curry leaves. Saute for few seconds and turn off heat. Add to the fermented ragi idli batter and prepare idli. To check if the idlis are done, wet finger and touch the surface of the steamed idli. If it does not stick to your finger, the idlis are done. What is crea of rice? can you more specific? It goes by the name rice rava, idli sooji or cream of rice. Its a very fine granular form of ground rice. Please do not mistake it for biyyam rava. Sailu its a very lovely presentation. Generally we use 1 ratio of urad dal with 2 ratios of idli ravva to make normal idli. In your method u added 1 more ratio of ragi flour. Doesn’t it make them hard? It is also called idli rava in tamil nadu.. I think cream of rice is nothing but broken rice (just a fancy name created by marketers to charge fancy prices in foreign countries). It is called “arisi rava” in Tamil. It consists of coarsely broken rice sold as such, and used for rice idly, etc. You can take some dry rice and break it into coarse bits in your mixer to turn it into arisi rava. Arisi Rava is not as fine as cream of rice. Arisi Rava is different from Idli Rava. Can we use idly rice instead of cream of rice? Cream of rice is upindi nooka in telugu,we made one kind of upma using this.its not fancy name created by marketers. Sailu, your presentation is lovely! Your photo, with the chutney and curry leaves, made the brown idli look more appealing. Can we use whole grain ragi instead of flour. What about sprouted ragi..will it give the same taste. You can’t use the whole ragi grains as such, but you can certainly grind it into ragi flour and then use the flour. That is what we used to do once upon a time, with wheat, red chillies, etc: take it to the mill and grind it ourselves. We can be sure of better quality and no adulteration, but more work is involved. But nowadays such flour mills have disappeared. You can try to dry grind it finely in your mixer at home, but it is much more convenient to simply buy the flour. No cream of rice is not the same as Upma rava (sooji or semolina). Shailu , A suggestion with respect to the time required to prep the batter. I found it misleading. I thought it was an instant idli recipe until I read the soak and fermentation time will take 12-13 hrs. Its up to you but thought of sharing what I felt after reading. My 2 cents – I liked everything about your recipe except the soda. Usually, if the skinless whole urad dal is clean, without any insects, soaked well and ground to a soft fluffy batter you don’t have to use soda. Soda use over a period of time is not desirable. Hi Sailu. 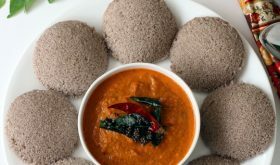 Can we mix ragi flour to existing fermented idli batter and make ragi idlis immediatley? You have to add ragi flour to the idli batter at the time of fermentation. Let the batter ferment and then make idlis.